Hello everyone! I got a few emails asking for MORE Prezi Well this is kind of an addendum to the original Prezi post. This is my step by step explanation of how to begin with Prezi (with images!) I am calling this, Part II. If you have not read Part I, that is okay! Part I was simply the tutorial from Prezi. Some people (if you are like me) probably skipped right past the tutorial and began playing with the presentation software. This post will walk you through the basic elements that you need to know at the beginner level. I know that everyone learns differently, so this may be a perfect starting point for some of you. This set of step-by-step instructions will cover all of the basics. Once you have your Prezi account set up, you are ready! Here are the basics! This is exactly what you will see when you begin a new Prezi. The design screen is your palette. You begin click to add any text that you chose. I clicked twice and added two different sets of text. The key to your design is what Prezi calls a zebra. Once you add text, the zebra appears over the text. This is how you control the placement and size of the text. Here is my screen after adding two lines of text. Notice the zebra circled in purple. It is a bit of a stretch to call it a zebra, but that is the official name! If you look at the bottom left corner of the zebra, you will notice a + sign. When you press this, it turns into a – sign and other options display in a blue textbox. These are great tools for editing your text. These options are straightforward and easy to explore. Another key element to manipulating your Prezi is the menu. Dubbed the Bubble Menu by Prezi, this is how you will turn your basic presentation into something spectacular. Note that this is circled in orange. Once you have your images inserted, the next step is to create a path. 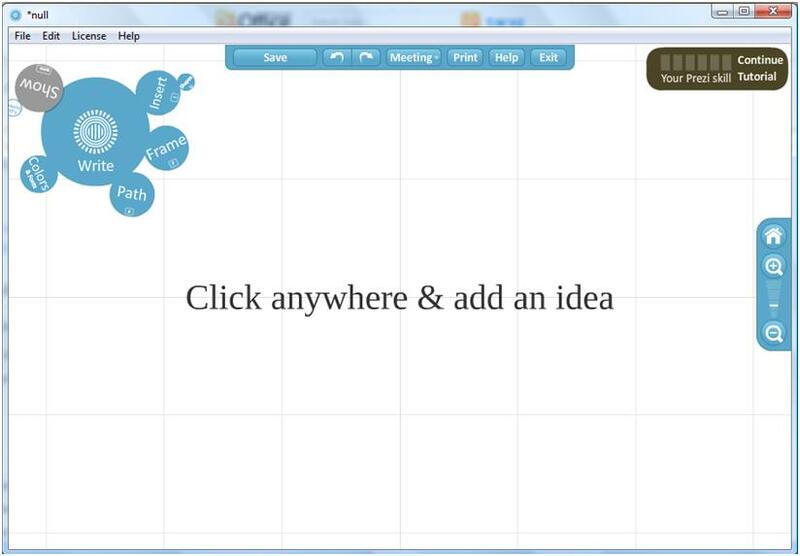 This is where Prezi begins to leave Microsoft PowerPoint way behind in terms of functionality! A path is basically the order in which objects appear in your actual presentation. To do this, click PATH on the menu. This is the area highlighted in orange above. The path just lets you click on each object sequentially. You are able to dictate which element appears first. Once you have this set, you can actually present a basic Prezi! To control the show, you just use the arrow keys on your keyboard to go from element to element, creating a presentation. As simple as this is, the results are dynamic and really draw your interest in! Stay tuned for Part III where we will explore some features beyond beginner tools! This is an awesome resource — I look forward to seeing the rest of it! I like what you guys are up too. Such smart work and insight! Keep up the superb works guys I have incorporated you into my blogroll. I think it’ll improve the value of my website :).